Jonathan Bailey's last appointment in the British Army before he retired in 2005 was Director General Development and Doctrine. He served in Northern Ireland, commanded Assembly Place ROMEO in Rhodesia in 1979-80; was Operations Officer 4th Field Regiment RA during the Falklands War; and in 1999 was KFOR's Chief Liaison Officer to the Yugoslav General Staff and to the Kosovo Liberation Army. 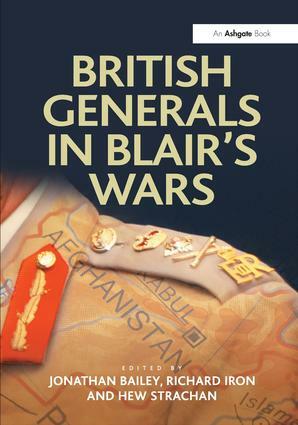 He has written several books and articles on defence and strategic themes. Since 2005 he has worked in the defence industry, and led the seminar series on Campaigning and Generalship, at the University of Oxford. Richard Iron left the British Army in 2012 and is a visiting fellow at the University of Oxford. He has served in the Sultan of Oman's Armed Forces and several tours in Northern Ireland. He commanded 1st Battalion the King's Own Royal Border Regiment in the Balkans. He was subsequently responsible for British and NATO land doctrine. He was a prosecution expert witness in the Sierra Leone War Crimes trials and from 2007 to 2008 was chief mentor to the Iraqi commander in Basra, including Operation Charge of the Knights. Sir Hew Strachan is Chichele Professor of the History of War, Fellow of All Souls College, Oxford and was Director of the Oxford Programme on the Changing Character of War from its inception in 2004 until 2012. He is the author of several highly acclaimed books on military history, including European Armies and the Conduct of War (1983), The Politics of the British Army (1997), and The First World War: Volume 1: To Arms (2001). He is a member of the Commonwealth War Graves Commission and the World War I Centenary Advisory Board. He has also written extensively on strategy, and is a member of the Chief of Defence Staff's Strategic Advisory Panel.